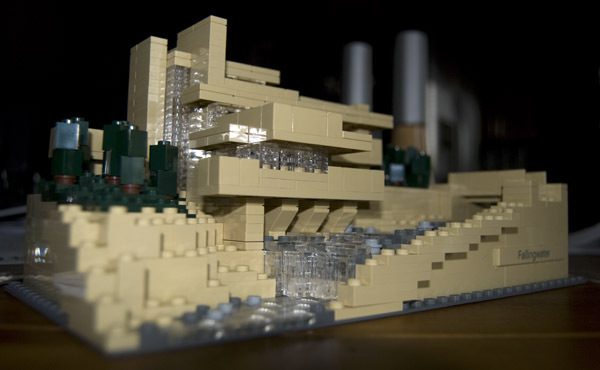 It is made of all of the smallest lego pieces, and actually took some time to build. I think I sat through three movies (not in one sitting) building this. I don’t remember this – or I didn’t appreciate it when I was a kid – but I liked the fact that during assembly everything fit so perfectly together, even though It looked like a bunch of unrelated parts for quite a while. The little model is built to be disassembled at each floor so you can see the floor plans (although they are greatly simplified). The thing cost $100, which I guess is normal for an “adult” lego set, and of course that was full retail price (but it was the Price Tower Art Center’s Gift shop, and yes, I became a member).